Stamp n Foil sets are the closest thing on the market yet to being able to stamp your stamps and foil. These are so cool! 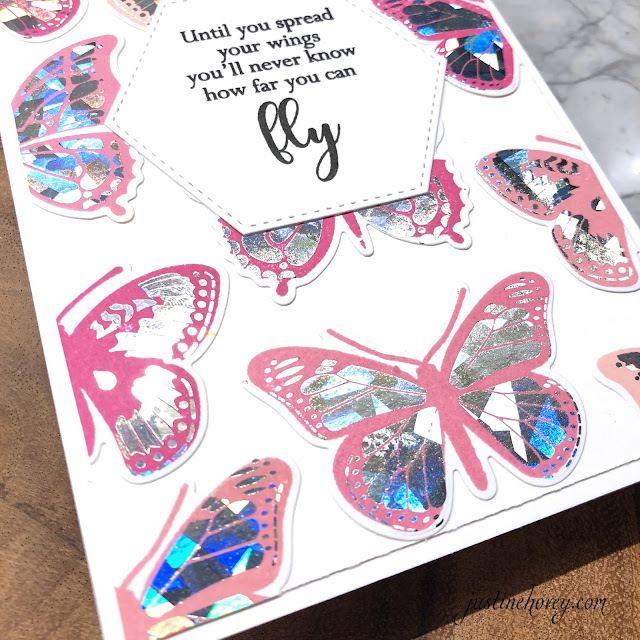 You can use the 6x8 stamp set on it's own if you don't have a laminator, you can add the Foil Mates so you can stamp over in the colour you prefer and foil and coordinating die cuts make cutting them out a breeze! Butterfly Kisses is my favourite one (it's butterflies...so obviously my favourite!) I created this fun background collage full of different shades of pink butterflies. I ran them through with some Shattered Silver Deco Foil which is one of my favourite new foil colours. The details are stunning! 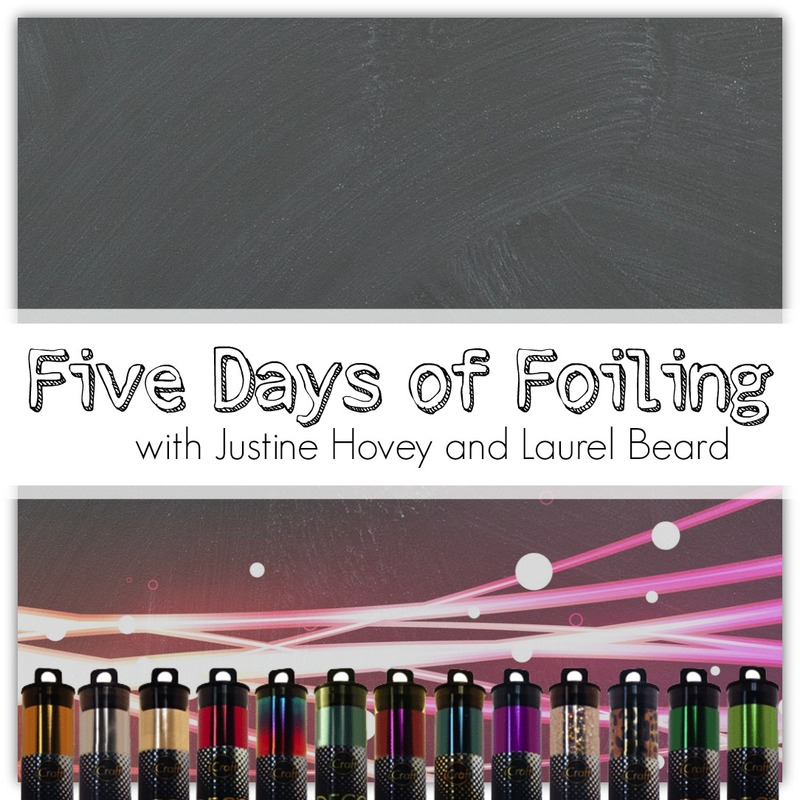 Don't forget that the Five Days of Foiling is a collaboration with Laurel Beard who is also working with Stamp n Foil today. Be sure to check out her video and blog! Where Flowers Bloom is a nice versatile set of floral and fauna images. 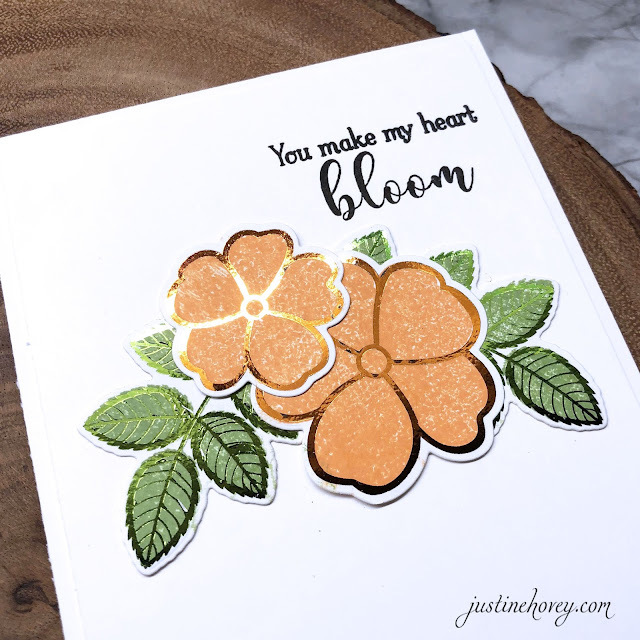 I love how you can foil and stamp the flowers in whatever shade you want! You can even mix colours to make it more interesting. For this card, I used Sweet Mango and Grass Green. Birthday cards are something cardmakers make most often. 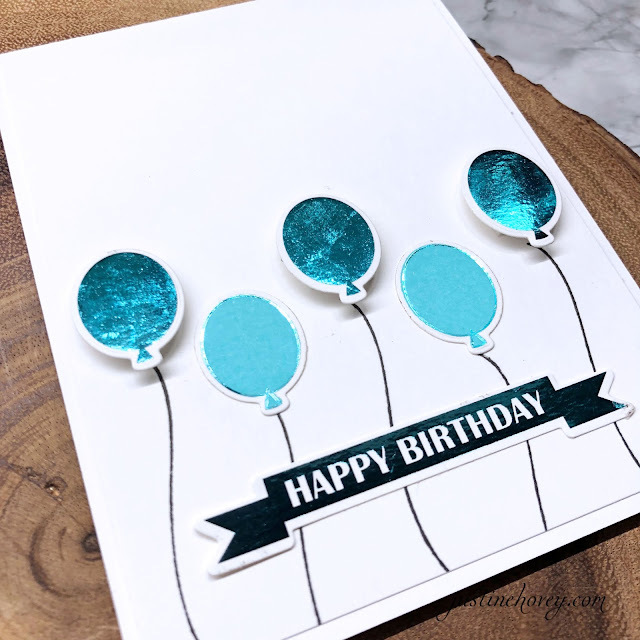 I decided to mix and match solid foiled balloons from the Time to Celebrate set with stamped balloons that have a foiled outline. 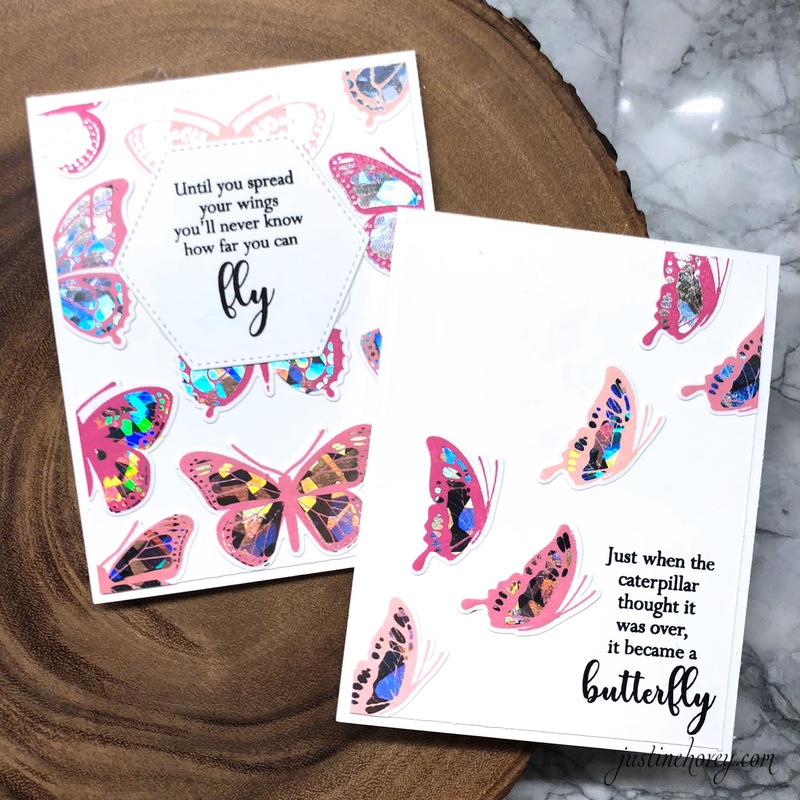 Beautiful close-up cards especially the cover all of the butterflies...such pretty colors....thank you for sharing the foiling series. I'm loving this foiling mini-series! Such fun and both y'all are creating so absolutely stunning cards. These are so beautiful Justine, I so love the Where Flowers Bloom Foil-Mates as the leaves look gorgeous foiled! Beautifully done! Justine - your cards are always so amazing! I think foiling might be a new love of mine!! 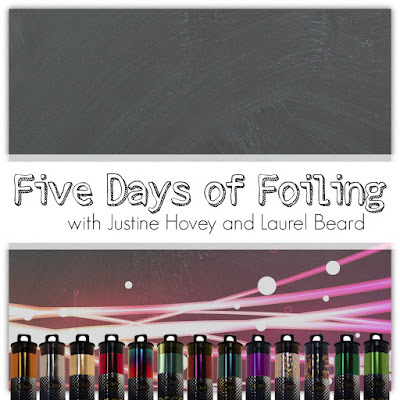 so enjoying the foiling videos and the beautiful cards you and Laurel are creating! The foiling technique is a new one for me....and I just bought Gina K's sets to start to try them out. Laminator arrived too...so here we go. Another great video! Your cards are always gorgeous! Great cards! I especially love the CAS birthday card. These stamp sets are great on their own, but awesome with the foil mates! Oh I LOVE all your cards!! They are stunning!! Fun cards. I love the butterflies. Thanks for sharing your ideas with us. I really like the butterflies and balloons. Thanks for sharing . I love the Shattered Glass with the pink butterflies, beautiful cards. Great cards! The foiling adds so much WOW to projects. The Shattered Glass is amazing. Love seeing you demonstrate these products. The butterflies are my favorite. Beautiful cards! Loving this series, Justine! I hadn't seen the shattered glass foil. I'm loving it and will have to add it to my stash. I have made quite a few cards using foiling but these Gina k designs just makes a great thing spectacular! Tutuapp apk , the application which gives to access to all the paid applications for nothing; this is the application which will release you for the boundless Tutuapp download of the considerable number of recreations which are accessible for nothing.